IT’S NOT WHERE YOU LIVE, IT’S HOW YOU LIVE THAT MATTERS. 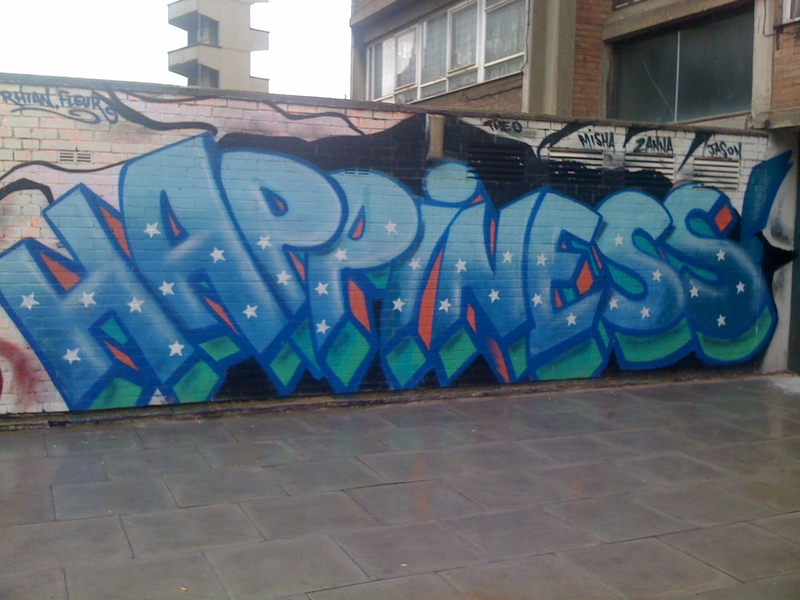 I smile a lot regardless, but taking photos of this London graffiti wall made me feel like I’d won the lottery. I was having a lovely time in London anyway and it seemed like life had fired me one of its ‘message received’ signals. I smile about that day even now and as deep in my photo archives as it is buried, it pops up frequently and randomly yet always when I am in just that space to nod in agreement and chuckle to myself. Happiness, to me, is loving and knowing who I am no matter what state I wake up in in the morning or go to bed at night. It’s having a clear conscience, knowing that I have done as much good in my day as was possible and that I have not knowingly or purposely done anyone or anything any harm. It is loving and giving love to myself, to my family and to the people and the world around me. It is the feeling of being inspired by and grateful for everything the day and the world has to offer. Happiness is knowing that happiness itself isn’t something that I rely on anyone else to give me, or that someone else can make me, it is in me always so I needn’t travel any distance to find it. Even though I like fancy cars and nice houses as much as the next girl, it’s not about the fairytale where you live or with whom, it’s about the real life HOW you live. And it’s about how you live with your Self. Happiness is knowing that no matter what happens in life, I know who I am – anyone who doesn’t or just thinks they do will just have to catch up. It’s knowing that I have a choice – if I don’t like something I can stop and do something else. Happiness is knowing that the world won’t end if I do. Happiness is knowing that as many endings as there are will be equalled by exciting new beginnings. Happiness is knowing that there are always solutions and options. Happiness is sunshine through the window, a breeze on my face, chanting, praying, sitting in silence, reading, running, dancing, listening to and making music, writing without using any punctuation, learning new things, making things work, clean teeth, a hot bath or shower, a warm bed, having enough to live how I want yet not enough to keep me hungry and on my grind. It’s having an opinion, having a roof over my head, laughing with friends, having deep discussions then acting the fool. Happiness is a huge bucket of popcorn, a great movie and a pick n mix bag of haribo. Happiness is everything that happens in a day and everything that happens at night and knowing that anything that goes pear shaped will soon be made right. Happiness is knowing that even though I may not get another tomorrow, I have done my best today. Happiness is getting another tomorrow. Happiness is having the sweetest dreams and even sweeter wake ups. Happiness is life, love and the universe.